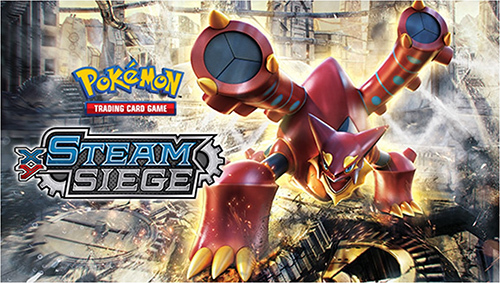 Join us to celebrate the pre-release of the 10th set in the Pokémon XY series, Steam Siege, on Saturday, July 30th. Registration will start at 10:00 am and the event will begin at 11:00 am. Early registration is encouraged, as there are a limited number of seats. Players will each receive a special Steam Siege pre-release kit containing 4 packs of Steam Siege, 1 special Evolution pack, and a stamped Promo card. Players will then utilize these cards, plus basic energy (provided by the store), to build a 40-card deck with which to play. At the end of the event, each player will receive an additional 3 packs of Steam Siege for participating. The cost to enter is $25. Pre-releases are a fun way to play Pokémon, and a great opportunity to check out new cards before they are generally available. This event is appropriate for all ages of players who can read on their own.